A glucose-6-phosphate isomerase peptide induces T and B cell-dependent chronic arthritis in C57BL/10 mice: arthritis without reactive oxygen species and complement. Immunization with human glucose-6-phosphate isomerase (hG6PI) protein or with several of its peptides induces arthritis in DBA/1 mice. We investigated G6PI peptide-induced arthritis in C57BL/10 mice and the effect of oxidative burst on disease. To study the arthritogenicity of G6PI peptides and its immune dependency, we used genetically modified and congenic mice on the C57BL/10 background and in vitro T- and B-cell assays. hG6PI(325-339) peptide induced arthritis in C57BL/10 mice. The disease was associated with major histocompatibility complex class II and was dependent on T cells, B cells, and complement C5. Th1 and Th17 cells primed with the hG6PI(325-339) peptide cross-reacted with the murine G6PI protein. The severity of the disease increased in mice carrying a mutation in Ncf1 (Ncf1*/*), which abolishes the NADPH oxidase 2 complex oxidative burst. Ncf1*/* mice developed arthritis also on immunization with the mouse G6PI325-339 peptide and in the absence of C5. 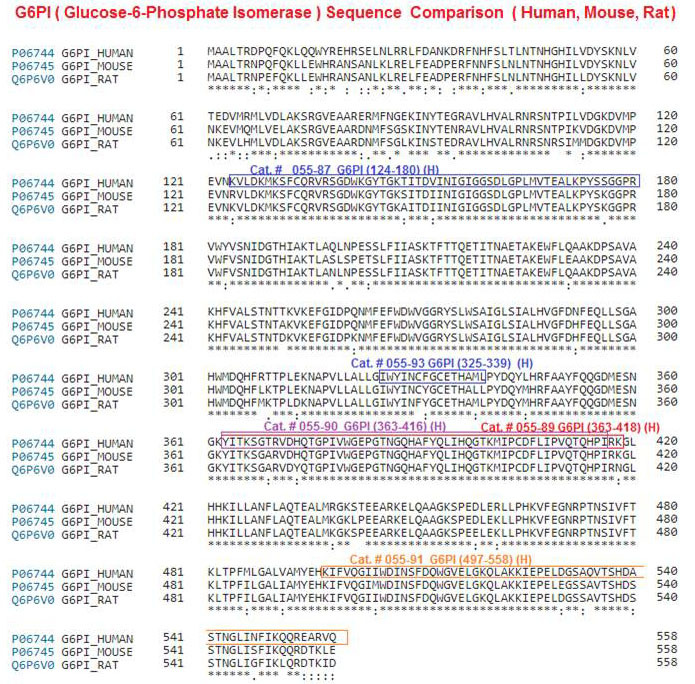 The antibody responses to the G6PI protein and peptides were minimal in both Ncf1*/* and wild-type mice. Herein is described G6PI peptide as the first peptide to induce arthritis in C57BL/10 mice. The differences between the wild-type and Ncf1*/* mice suggest that an alternative complement-independent arthritogenic pathway could be operative in the absence of oxidative burst. Pizzolla A, Wing K, Holmdahl R. Am J Pathol. 2013;183(4):1144-55. AMF/G6PI induces differentiation of leukemic cells via an unknown receptor that differs from gp78. Autocrine Motility Factor (AMF)/maturation factor (MF)/neuroleukin (NLK) is a multifunctional protein, which acts as a glucose 6-phosphate isomerase (G6PI) intracellularly. Exto-G6PI stimulates invasion and metastasis of tumor cells, neurotropic growth and differentiation of leukemic cells. The cell motility and proliferation receptor is known to be gp78 (78 kilo-Dalton glycoprotein), which has seven transmembrane domains in its N-terminal region, but the maturation factor receptor remains unclear. The human acute monocytic leukemia line does not express gp78 and its motile activity is not enhanced by AMF though it is well differentiated by AMF exposure. The forced expression of gp78 in leukemic cells recovered acceptable motile stimulation, concomitant with reduced differentiation ability. Two unknown proteins were detected by crosslinking between AMF and leukemic cells. The results of this report suggest that the receptor molecule for AMF/NLK/MF in leukemic differentiation is not gp78. Haga A, Komazaki S, Funasaka T, et al. AMF/G6PI induces differentiation of leukemic cells via an unknown receptor that differs from gp78. Leuk Lymphoma. 2006;47(10):2234-43.